Hurricane Harvey's impact on Houston's commercial real estate market is substantial. 27% of Houston’s gross leasable area may be flooded today, representing an estimated $55 billion in property value. CoStar Group, Inc, the leading provider of commercial real estate information, analytics and online marketplaces assessed the potential impact Hurricane Harvey could have on the Houston commercial real estate market – multifamily, office, retail and industrial buildings - and found that 27% of the gross leasable area may be flooded. This represents $55 billion in property value. More importantly, some 72,000 apartment units sit within the 100-Year floodplain, and are likely to be flooded today. In total, there are 12,000 properties with 400 million square feet of space that fall within the 500-year floodplain. Only 9 million square feet of space, including 4,000 apartments are within a designated floodway and most are probably inundated with floodwaters today. However, 175 million square feet located in the 100-year floodplain, including 72,000 apartment units and 20 million square feet of office space, are likely seeing water incursion today. Another 225 million square feet sits in the 500-year floodplain and is also at some risk of flooding. The submarket that will be most affected is likely to be Southwest Houston. This highly dense section of Houston is home to more than 66,000 apartment units, of which nearly 30% are estimated to be impacted. 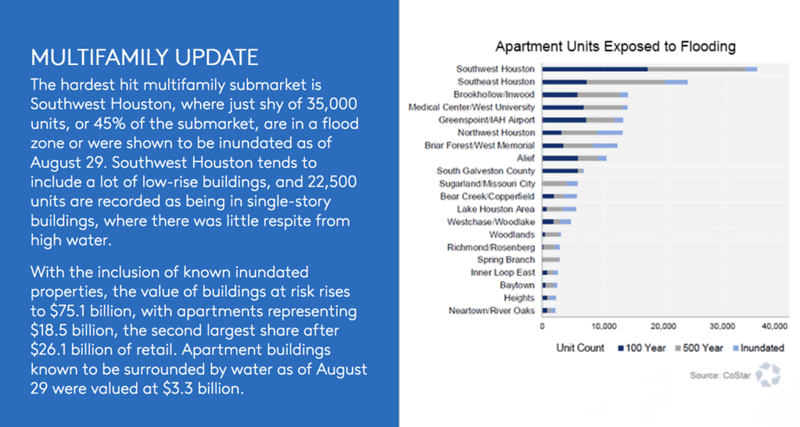 Within Southwest Houston, the Braeburn, Greater Fondren and Sharpstown neighborhoods have the highest number of units that are in the 100-year floodplain. Each of these neighborhoods borders Brays Bayou, one of the river ways that snakes through Southwest Houston and has overflowed because of the torrential rain. An additional five million square feet of space is under construction within the floodplain, including 3,144 apartment units. This represents about one-fifth of the 25 million square feet of commercial real estate under construction in Houston (which includes more than 12,000 apartment units). Most of the apartment buildings (1,170 units) under construction within the 100-year floodplain are concentrated near the Medical Center. The most impacted office submarket is Greenspoint, which has elevated vacancies after the departure of Exxon Mobil in late 2015. Here, some 3.5 million square feet falls within the 100-Year floodplain.